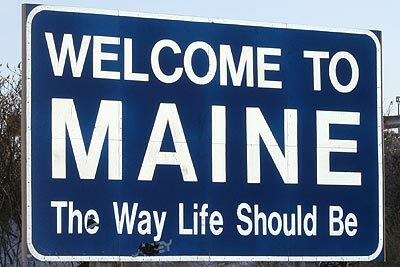 Maine is a state of the United States. It is probably named after the French province of Maine. Its U.S. postal abbreviation is ME. Four U.S. Navy ships were named USS Maine in honor of the state. Maine has a long tradition of personal self-reliance, and Yankee ingenuity. The capital of Maine is Augusta. Maine's politics are notable for several reasons. In the 1930s, it was one of very few states which remained dominated by the Republican Party. In the 1936 presidential election, Franklin Roosevelt received the Electoral Votes of every state other than Maine and Vermont. Maine voters tend to accept independent and third-party candidates more frequently than most states. Maine has had two independent Governors recently (James B. Longley from 1975 to 1979 and Angus King from 1995 to 2003). The Reform Party of Ross Perot achieved a great deal of success in Maine in the 1992 and 1996 Presidential elections: in 1992 Perot came in second in Maine to Bill Clinton, despite the longtime presence of the Bush family summer home in Kennebunkport, and in 1996, Maine was again Perot's best state. To the south and east is the Atlantic Ocean, and to the northeast is New Brunswick, a province of Canada. The Canadian province of Quebec is to the northwest. Maine is the northernmost state in the New England region and the easternmost state in the country (the easternmost city in the United States is Eastport, Maine), bordered on the west by New Hampshire. 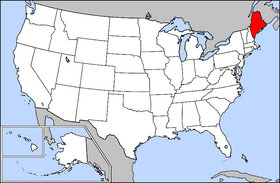 It is the only state that borders exactly one other state. Its largest lake is Moosehead Lake, and its highest mountain is Mt. Katahdin, which is the northern terminus of the Appalachian Trail. Maine's total gross state product for 2001 was $37.4 billion, placing it 43rd in the nation. Its per capita personal income for 2000 was $25,623, 36th in the nation. Maine's agricultural outputs are seafood (notably lobsters), poultry and eggs, dairy products, cattle, blueberries, apples, and maple sugar. Aroostook County is known for its potato crops. Its industrial outputs are paper, lumber, and wood products, electronic equipment, leather products, food processing, textiles, and tourism. Naval shipbuilding and construction remain key as well, with Bath Iron Works in Bath and Portsmouth Naval Yard in Kittery. As of 2000, the state's population was 1,274,923. 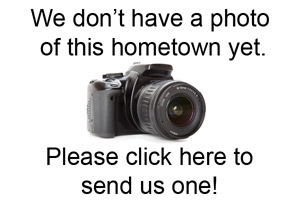 Where is Smyrna Mills, Maine? Smyrna Mills, Maine is located at Latitude 46.167332 and Longitude -68.270229. Smyrna Mills is in the Eastern (GMT -05:00) time zone. Telephone area codes in Smyrna Mills include 207. This hometown does use daylight savings time. Smyrna Mills, Maine is situated in Aroostook County. Aroostook County has an average elevation of 357 feet.